Westerners are mourning the death of Nelson Mandela with more sadness than that manifested by Africans. This mourning is a way to settle colonial ideology and crimes that were committed in its name. But it is incomprehensible that this torrent of tributes overlook the persistence of a racist state historically founded, as South Africa, according to the worldview of Cecil Rhodes, the theorist of “German imperialism.” Mandela’s example has yet to be followed. April 11, 1975, in Jerusalem in the Prime Minister’s residence. 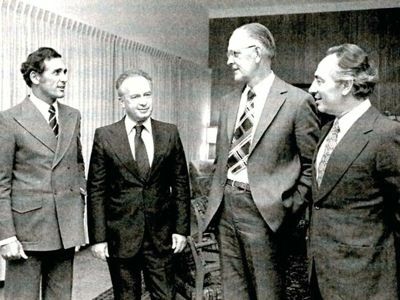 From left to right: Eschel Rhoodie (South African director of Propaganda), Yitzhak Rabin (Israeli Prime Minister), Henrik van den Bergh (Director of the South African secret service) and Shimon Peres ( Israeli Defense Minister). The work of Nelson Mandela is celebrated around the world on the occasion of his death. But what good is his example if we accept that there persists in a state – Israel – the racial ideology that he defeated in South Africa? Zionism is not a fruit of Judaism, which has long fiercely opposed it. It is an imperialist project born of British Puritan ideology. In the seventeenth century, Lord Cromwell overthrew the English monarchy and proclaimed the Republic. He established an egalitarian society and intended, as much as possible, to expand the power of his country. For this, he hoped to forge an alliance with the Jewish Diaspora which would become the vanguard of British imperialism. He therefore authorized the return of Jews to England, from which they had been driven four hundred years earlier, and announced that he would create a Jewish state, Israel. However, he died without having succeeded in convincing the Jews to join the project. The British Empire has since then not ceased solliciting the Jewish diaspora and proposing the creation of a Jewish state, as did Benjamin Disraeli, Prime Minister of Queen Victoria at the Berlin Conference (1884). Things changed with the theorist of British imperialism, the “Right Honourable” Cecil Rhodes, founder of De Beers diamonds and Rhodesia, who found in Theodor Herzl the lobbyist he needed. The two men exchanged extensive correspondence whose reproduction was banned by the Crown on the occasion of the centenary of the death of Rhodes. The world would be dominated by the “Germanic race” (that is to say according to them, the British, Irish included, the Americans and Canadians, Australians, New Zealanders and South Africans), which were to expand their empire by conquering new lands with the help of the Jews. Theodor Herzl was not only able to convince the diaspora to join in this project, but he overthrew community opinion by using its biblical myths. The Jewish state would not be a virgin land in Uganda or Argentina, but in Palestine with Jerusalem as its capital. So that the current state of Israel is both the son of imperialism and of Judaism. Israel, since its unilateral proclamation, turned to South Africa and Rhodesia: the only states to display Rhodes’ colonialism. Little does it matter, from this point of view, that the Afrikaneers had supported the Nazis, they were nourished by the same worldview. Even though Prime Minister John Vorster did ​​not officially travel to occupied Palestine untill 1976, starting in 1953 the General Assembly condemned “the alliance between South African racism and Zionism.” The two states worked in close collaboration, be it in manipulating the Western media, transport to circumvent embargoes, or again to develop the atomic bomb. Nelson Mandela’s example shows that it is possible to overcome this ideology and achieve civil peace. Today, Israel is the only heir to the world of Cecil Rhodes’ imperialism. Civil peace requires Israelis and Palestinians to find their De Klerc and their Mandela.